HCM City (VNA) – Online transport services that connect inter-provincial transport companies have reduced costs and helped reduce pollution by having fewer trucks on the road. A transport company in HCM City, for example, said its trucks carrying construction materials to Binh Phuoc province had cut the price from 5 million VND (222 USD) to 3.2 million VND (142 USD) after negotiating with customers on the website www.vinatrucking.com. “Our website aims to create a place where truck owners and customers who have demand to transport their goods can meet. The two sides can negotiate directly through our website,” Ta Cong Thuan, director of online transport service Vinatrucking, was quoted as saying in Tuoi Tre (Youth) newspaper. “Through our website, many customers have saved a lot on transport expenditures while truck owners can increase their efficiency by loading goods in both directions,” Thuan added. Thuan expected that the number of successful transactions would increase, reducing the number of trucks on the road. “Once the transaction has been planned, it can be applied to both goods and passenger transport,” Le Minh Tu, CEO of Aleka, another online transport service, said. Tu plans to offer online services for customers who want to rent a bus. The website will have information about expenditures and the proper bus. Despite the potential, the services have had a hard time attracting customers. “I joined vinatrucking.com for a short time but there were not any successful trips for us because customers paid attention only to long trips, like from the north to the south. For other short-distance trips, like HCM City to Binh Duong province, customers didn’t care,” Lam Dai Vinh, director of Lam Vinh transport company, said. “Payment through online services is also complicated,” Vinh added. Ta Cong Thuan said that his website now has over 1,000 companies, but he does not know the number of successful transactions as enterprises have not provided information. 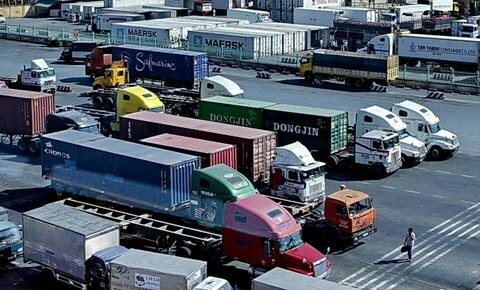 “Passenger transport can collect money immediately, but for goods transport, truck owners need contracts and negotiation,” Thuan said. He said that many truck owners and customers were still unaware of or lacked trust in the new online services. Le Minh Tu said that if two sides want to do business, they must sign a contract. “It is totally different with Grab or Uber. This service is new and not many people know about it,” he said. “Many enterprises do not have a habit of doing transactions through websites, so we need time for them to change,” he said. Pham Sanh, a transport expert, said the services have limitations, including unrealistic prices and few enterprises with well-known brand name. “To build trust, information from enterprises must be controlled and the website should have penalties for anyone who violates the regulations,” he said. “The Ministry of Transport should release a legal framework for the new model. I believe that in the near future, the model will develop because of demand,” Sanh added. Between 60-70 percent of trucks now transport goods in one direction, which results in higher costs for customers.